Cardamom County Resort offers a fantastic opportunity to go bamboo rafting through the Periyar Tiger Reserve. The hike to the rafts and the ride along the lake allow you to experience first-hand the beauty of the Tiger Reserve while getting a behind-the-scenes view of the jungle and the animals that inhabit it. I was able to participate in this wonderful activity and would highly recommend it to all resort visitors. We set out at 8 am into the Periyar Tiger Reserve. Upon arriving, we walked through a small section of forest. There the trees were filled with Nilgiri Langurs and many species of birds, including Painted Spurfowl, Spotted Dove, White-throated Kingfisher, Black Drongo, Greater Racket-tailed Drongo, Yellow-browed Bulbul, Jungle Babbler, Yellow-billed Babbler, Jungle Myna, Common Myna, Lesser Hill Myna, and Nilgiri Flowerpecker. After this portion of the jungle, we arrived at the meeting point for the bamboo rafting excursion where our guides were waiting. The guides were terrific. They were very hospitable and friendly, extremely knowledgeable of the trails and the wildlife, and made the trip relaxing and enjoyable. In fact, all the guides I have met in the Periyar Reserve have been wonderful. After joining the guides, I got the chance to bird for a little before we set out. The meeting place for the rafting looks out over a small body of water in which you can find Woolly-necked Stork, Indian and Little Cormorant, Darter, Indian Pond Heron, Little Egret, Brahminy Kite, Malabar Parakeet, Indian Swiftlet, Little Swift, Asian Palm-swift, Common Kingfisher, White-throated Kingfisher, Pied Kingfisher, Ashy Woodswallow, and the same three mynas. The first part of the tour is a hike, taking you along the jungle’s edge during which you spend a majority of the time walking beside one of the estuaries that feed the Periyar Lake. Both the forest’s edge and the river are great for wildlife. We were able to find many bison feeding in the fields beside the river and even two groups of elephant grazing and strolling along the treeline. You will be able to get great views of both these amazing animals, and if you bring your camera (a must if you ask me), you will capture some incredible photos. The habitat soon shifts to a more grassy landscape interspersed with trees and bushes. The birding here is fantastic; in the fields and the surrounding trees you can find Red-wattled Lapwing, Nilgiri Wood-Pigeon, Mountain Imperial-Pigeon, Malabar Parakeet, Vernal Hanging-Parrot, Asian Drongo-Cuckoo, many species of swift, several species of kingfisher, Chestnut-headed Bee-eater, Indian Roller, Black-rumped (Lesser) Flameback, House and Large-billed (Indian Jungle) Crow, Malabar Barbet, Velvet-fronted Nuthatch, Golden-headed Cisticola, three species of myna, Brahminy Starling, White-browed Wagtail, and Oriental (Paddyfield) Pipit. In addition, keep your eyes to the sky as there are many raptors to be found here. Look for Oriental Honey-Buzzard, Brahminy Kite, Crested Serpent-Eagle, White-eyed Buzzard, Black Eagle, and Bonelli’s Eagle. The walk is no more than a few kilometers, and pretty soon you reach the lake on which you will raft. The lake is spectacular. With tree snags sticking out of the water and mountains in the background, it presents terrific photo opportunities. It is here that you board the raft. You will cross only a small section of the water before stopping for tea and a snack. After the quick stop, you return to the raft and begin a beautiful trip. Keep your eyes open for bison, elephant, wild boar, and possibly (although less likely) tiger along the forest edge or drinking on the banks of the lake. There are a few additional bird species that can be seen as you raft, including Little Grebe and River Tern, with the previously mentioned birds still viewable. After rafting for a bit of time, you will stop for lunch. The lunch they served me was a delicious rice dish mixed with carrots, onions, and green beans. The guides also carry extra bottles of water. You will eat at the water’s edge watching cormorant, darters, egrets, and terns fly by. Following the lunch break, you will begin rafting back. Again watch for the various species of mammal that can be found in the Reserve as they may step out of the jungle for a drink following the midday heat. The return trip is the same route as the outgoing trail, but in the jungle the bird species seen constantly change so make sure you watch out for new species flitting in the trees, walking in the grass, or singing atop a nearby bush. On the way back we were able to find bison, elephant, and wild boar again, and I was able to get good photos of all of them. After the hike back, you will return to the meeting spot and depart. As you walk back through the forest, however, make sure you stay alert as new birds and mammals may have arrived. We were lucky enough to see a Malabar Giant Squirrel feeding in a nearby tree along with Langurs and Bonnet Macaques. With that, our day in the beautiful Periyar Tiger Reserve came to a close. The beauty of this wild Reserve will simply amaze you, and I can think of no better way to enjoy the majesty of this location than to do the bamboo rafting, banked by the lively jungle and the awe-inspiring mountains. The wildlife you can see during this activity is simply amazing. Being a birder I was thrilled by the tremendous variety of birds. Since some of the birds that can be found here in the Reserve are very unusual and very limited geographically, getting an opportunity to observe these species was truly exciting. The mammals speak for themselves. Not many people get a chance to see elephants so close, or families of wild boars mingling along the water’s edge, or enormous bison feeding just a few yards away. 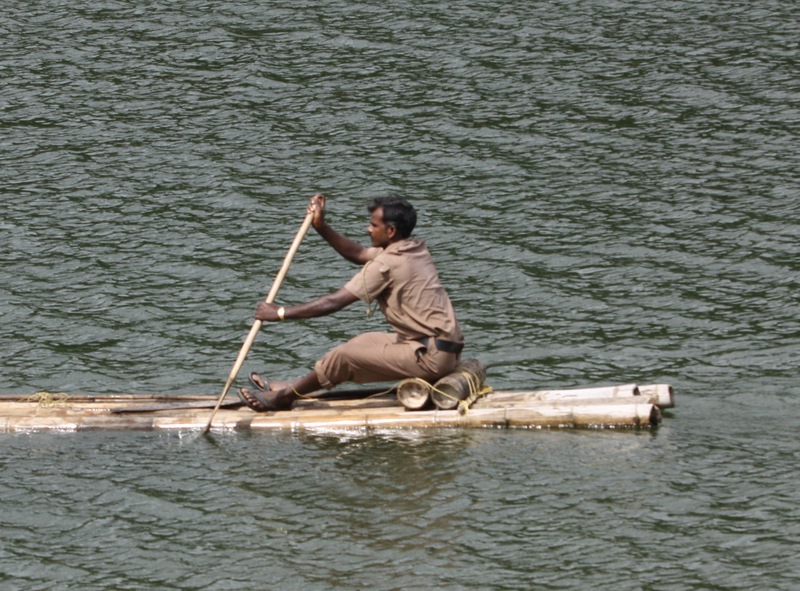 Taking a bamboo raft excursion in the Periyar Tiger Reserve is an experience I will remember for the rest of my life. The people, the animals, and the scenery are all incredible. If you have the opportunity to participate in this activity, please do. The hike is not too strenuous, the rafting is relaxing and absolutely beautiful.